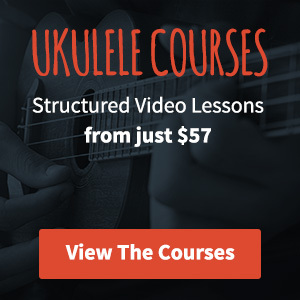 Recently I’ve been playing a lot of improvised solo stuff on my ukulele – it’s loads of fun and it’s pretty simple to get started with. One of the things I really like about soloing is that if you have 2 ukulele players together you get a much more interesting sound when both players are doing completely different things. My son Ben plays a little ukulele and it’s really great to be able to play some backing chords and give him a scale to play over the top. It’s so much more enjoyable than us both playing the same part of a song. The minor pentatonic scale is a really good starting point for anyone wanting to get to grips with soloing. It comprises just 5 notes and gives you enough to start throwing down some of your own material. The minor pentatonic scale is always the same shape no matter what key you’re playing in. The only thing that changes is the position of the scale. In this instance I’m showing the C minor pentatonic scale which you can see from the root notes that I’ve named. 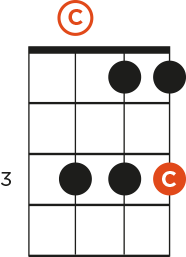 Note that the first root note is the open C string and doesn’t need to be fretted here. It’s a moveable scale, meaning you can play it anywhere on the neck by simply sliding the whole shape up by however many frets you want to move it. 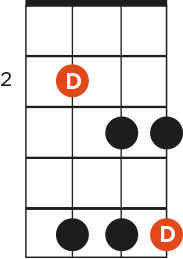 As the root note is now D, this is the D minor pentatonic scale. You can see the whole scale shape has been moved up. Which is, you’ve guessed it – the G minor pentatonic scale. A little fretboard knowledge goes a long way here, you can easily adjust the scale to be in whichever key you like by sliding it up and down the fretboard. 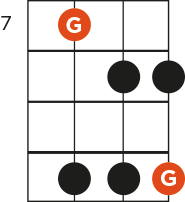 To begin with, get used to playing up and down this scale at various different positions on your fretboard – try playing it in quarter notes initially (one note per beat) before moving on to 8th notes (two notes per beat) and 16th notes (4 per beat) when you get really comfortable with the scale. In part 2 I’ll give you some backing tracks to play over and we’ll start to do some improvisation around the scale. Hi I am loving your website! Just wondering…if you are using a minor pentatonic scale for soloing/improvising….should you be playing a chord progression with Minor chords? If you’re playing a C minor pentatonic scale it would work best over a song in the key of C minor but don’t be afraid to experiment and use your ears as a guide!